MONTREAL (July 1, 2014) – Montreal Canadiens general manager Marc Bergevin announced today that the team has agreed to terms on a one-year (2014-15), two-way contract with free agent goaltender Joey MacDonald. Joey MacDonald has been signed to a one-year, two-way contract. 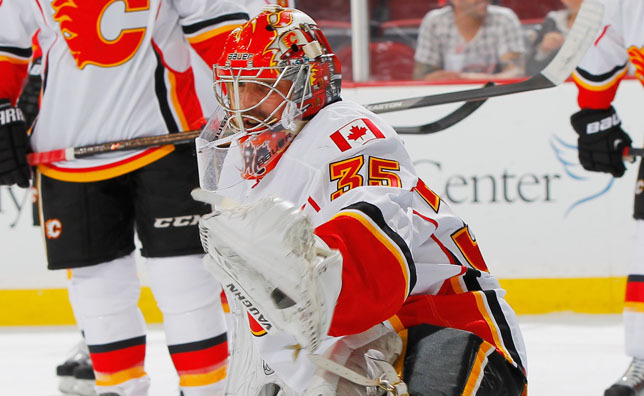 In 11 games with the Calgary Flames in 2013-14, MacDonald posted a 5-4-1 record. In that span, the 6’0”, 197 lbs goaltender had a 2.90 goals-against average. He stopped 235 of the 264 shots he faced, for a .890 save percentage. Since making his NHL debut with the Detroit Red Wings in 2006-07, MacDonald has posted a career 44-61-15 record in 133 regular season games. He has two career NHL shutouts to go with a 3.00 GAA and a .902 save percentage. At the AHL level, MacDonald has a 144-125-11 record in 300 career games between Grand Rapids, Bridgeport, and Toronto. He registered 24 shutouts and a 2.62 goals-against average to go with a .913 save percentage. At the junior level, MacDonald took part in 169 regular season games split between his one season with the QMJHL’s Halifax Mooseheads (1997-98) and the OHL’s Peterborough Petes (1998 to 2001). He maintained a 70-63-15 record, including six shutouts and a 3.01 goals-against average. A native of Pictou, Nova Scotia, MacDonald was claimed off waivers by the Flames (from the Red Wings organization) on February 11, 2013. Prior to joining the Flames, MacDonald suited up for the Red Wings, Boston Bruins, New York Islanders and Toronto Maple Leafs.